Another week of predictions come with the Premier League week 23 matches this weekend. With several teams having to play midweek FA Cup replays, it will be interesting to see the outcome of another weekend of matches. How will another set of midweek matches affect those teams involved? Will we have another high scoring weekend of matches following the week 22 results with 28 goals scored. In last week’s matches both Leicester and Arsenal failed to pick up maximum points while Man City’s win moves them closer to overtaking the league leaders. Yet, it is Tottenham at the top of the form table with 13 points from the last six matches. As far as fantasy Premier League matchups go for this weekend, there isn’t much in the way of great stacks to go with. Bournemouth have been playing well and picking players there should get you points going up against Sunderland. West Brom face Aston Villa, but they haven’t exactly lit up the Premier League in goals scored this season, though, defensively, they could get you some points. Much of this match will probably rely on what kind of team Aston Villa puts out in their Tuesday FA Cup clash. Man City and West Ham should have some goals in it and the return of Sergio Aguero means that his ownership will certainly rise. 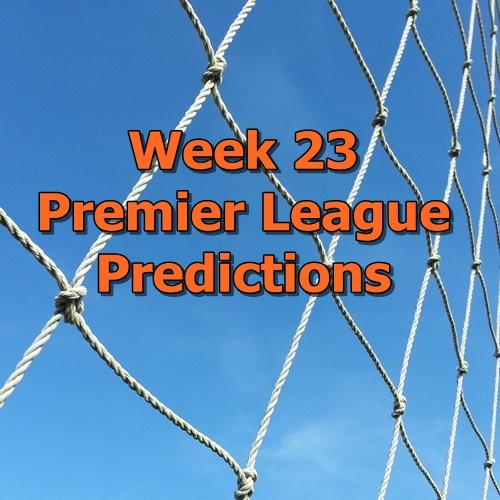 Whether you use these week 23 Premier League predictions for fun or for setting up your FPL team, I do wish you good luck!